In a previous post, I looked at combining a calendar with other forms of data visualization to explore the possibilities available. I want to continue this process, so in this post, I have decided to explore combining a timeline with other visualization methods. Timelines display a list of events in chronological order, typically with a line and with markers (typically using points) on that line to indicate specific points in time or events. These events marked out along timeline can be elaborated on with further information such as text, numbers, images, and icons. The two main types of timeline are a sequential timeline and a scaled timeline. There’s also a span timeline, which I will cover further on in this post. 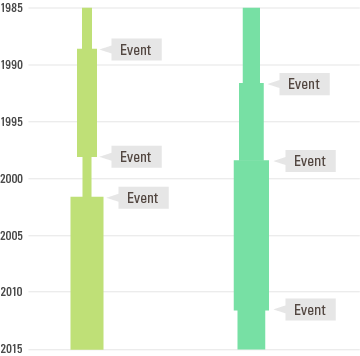 A sequential timeline simply displays a list of events chronologically, with a uniform distance between the event markers. So there’s is no sense of scale here, just a simple listing of events, which can be useful if space is limited. On the other hand, a scaled timeline displays a scale for time and positions event markers on the dates that those events take place. This allows you to see how events are distributed over time and to see if any patterns appear over a certain time period. Regardless of the type, the function of a timeline is to communicate time-related information, in order to visually present a story or view of history. Further analysis of the sequence of events can be enhanced through the display of additional, but relevant data. 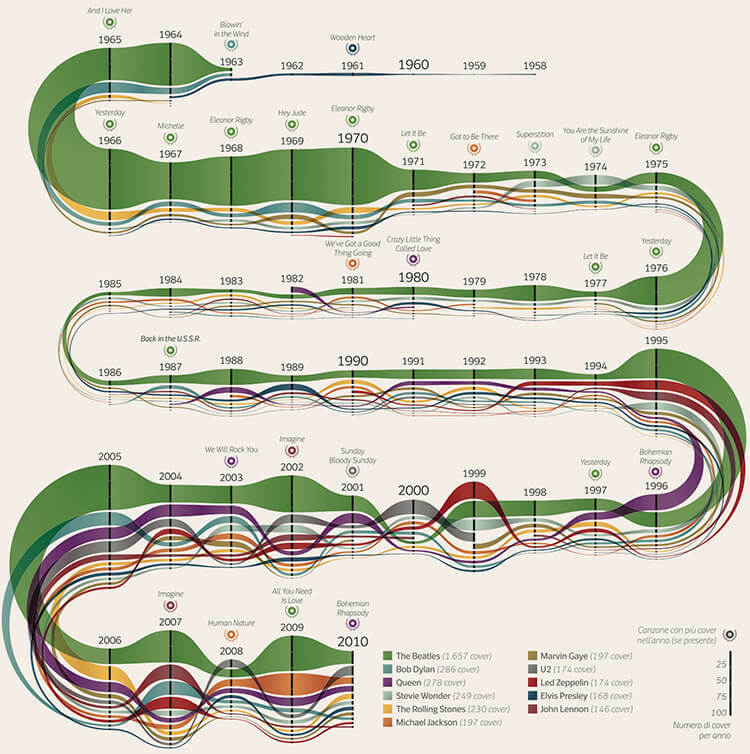 This can be done of course, by combining a timeline with other forms of data visualization, which is showcased throughout this post. 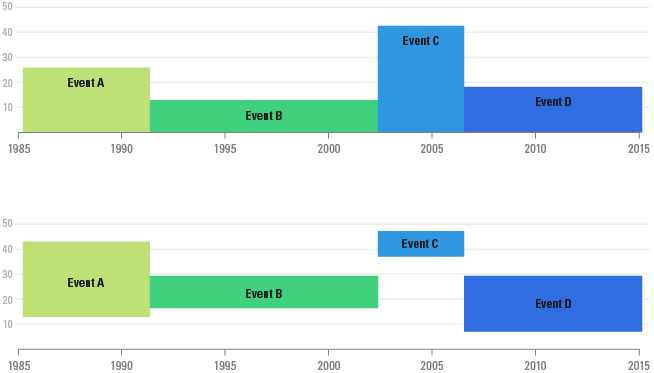 In this chart, arcs are used to display the connection between events and as you can see, it doesn’t look too dissimilar to the original arc diagram. On the left, I used a sequential timeline, while on the right, I used a scaled timeline to test if it made a difference. This combination chart could, of course, be enhanced through the use of arrows or varying the thickness of the arcs in proportion to some quantitive data. My worry with the first (left) chart is that it could be a bit misleading because although the spacing between the bars is uniform, the time between them isn’t. This issue is remedied with the chart on the right, which visualizes the bars on a scaled timeline. This version of the chart helps to show how the events and data are distributed, but it looks as if it’s an incomplete chart. This to me looks better, as the timeline is now more visually prominent. Of course, for the bars, you could make them readable by adding a value scale with gridlines or by displaying the values on top of each bar. But for the rest of the chart combinations that I’m displaying in this post, I don’t want to constantly dive into the charting design details. 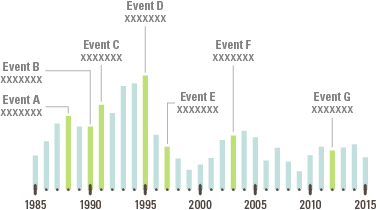 Using the length of bars to visualize ranged data can be applied in other ways. One way is to use the length of a bar to visualize the duration of events. Some digital calendars like Apple’s Calendar application will mark bars for events that occur over the entire day or for multiple days. 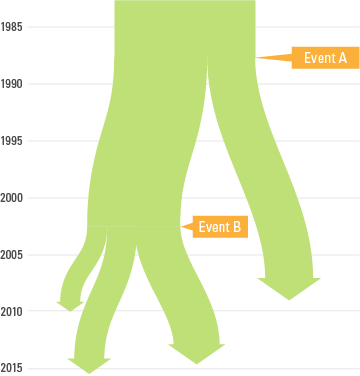 This same technique can be used on timelines to show how long events will last and if they overlap with other events. This type of timeline can be found in Google Charts and Docs. Ranged bars can be arranged on a single line to function as the actual timeline, to become a span timeline. See on Google Charts. This is not to be confused with a connected scatterplot, which plots and connects points sequentially in chronological order over a pair of variables on each axis. I would recommend for you to check out Alberto Cairo’s post, In praise of connected scatter plots, which has some nice examples of connected scatterplots being used as a sort of timeline infographic. The first variation plots the data directly onto the timeline, with the center of the circle being at the position of the date associated with the data. The second variation plot the data above the timeline, but uses a line marker to more clearly display what date it corresponds to. As you can see with these two variations, there’s a lot of overlapping taking place between the bubbles. One solution to this is to use the second variation and vary the vertical positioning of all of the bubbles so that none of them overlap. 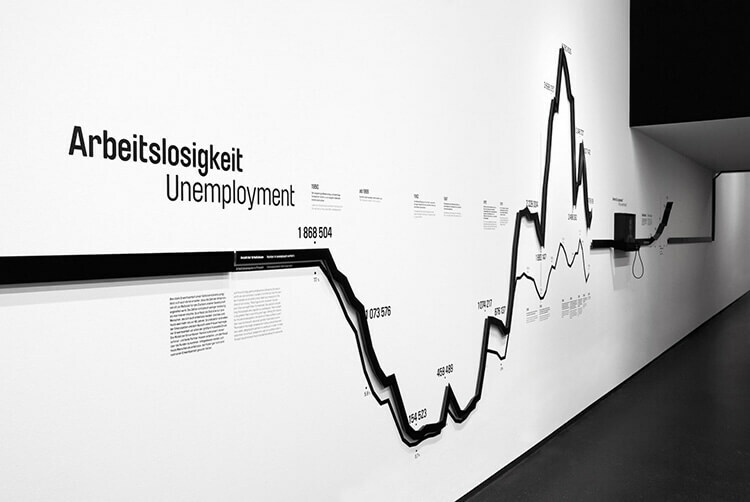 A great example of an area graph + timeline combination is Information is Beautiful’s Mountains Out of Molehills interactive piece. This timeline visualizes the intensity of various media-induced fearmongering for various themes. 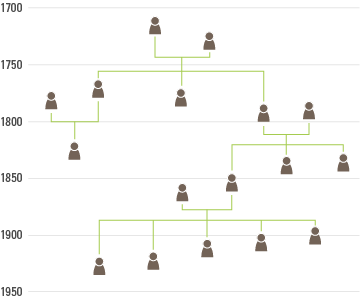 Normally in a flow map, you see the logical mapping out of a process or system and its sequential steps. When you combine a flow chart with a timeline, you can display where in time each step takes place. 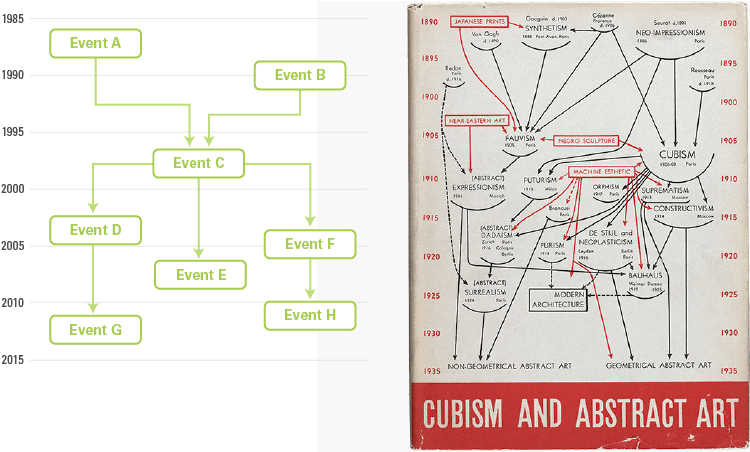 In the MoMA cover example, you can see when a particular artistic movement occurred in time and how it influenced other movements further down the line. I think I’ve produced enough timeline combinations for now, as I could go on for awhile doing this. But If you’ve got any examples of timelines combined with other forms of data visualization that I haven’t covered, then please post it in the comments section below.